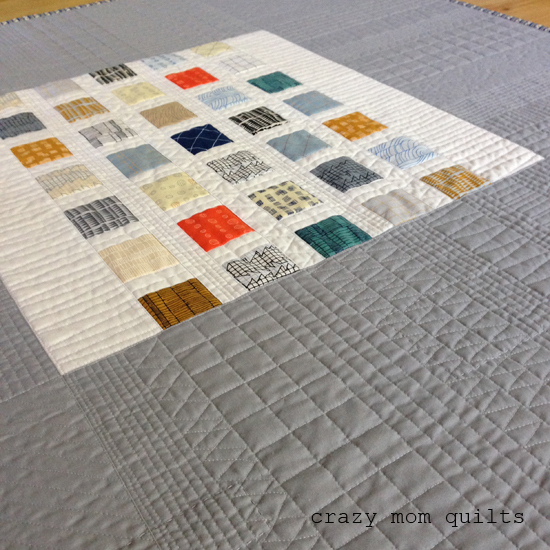 I'm excited to have another quilt finish to share today! borders and make it a wall/baby quilt size instead. I'm so glad I made that decision! This is a bit of a departure from my usual work, but I love it for that reason. It's good to stretch yourself once in awhile! For the fabric, I used a mini charm pack of doe, plus Kona cotton in white and iron, all by Robert Kaufman. I quilted it a la Carolyn Friedlander with lots of dense stitching. Some of it was done with my free motion foot, some was done with my regular foot. I didn't use my walking foot at all! 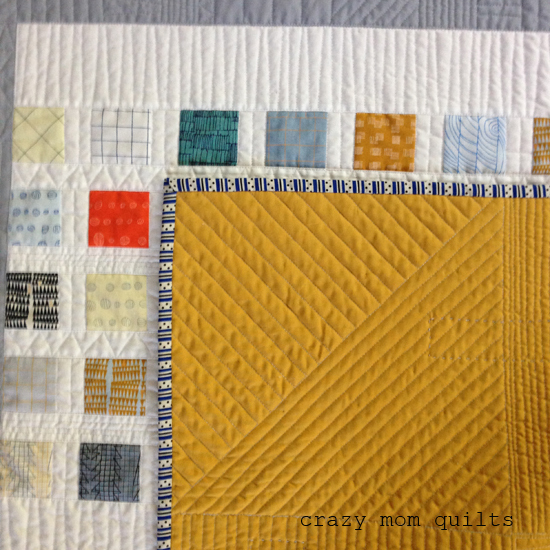 It was fun to make up the quilting as I went, but I did use a hera marker to mark most of the lines. It was a nice safety net. For the backing I used a solid goldenrod fabric. (I'm not sure of the company or color...it came from SR Harris.) I like--and don't like--that it shows ALL of the quilting. No room for error! But, it is a nice contrast to the front. I used Aurifil thread in my favorite color, 2600. I think it goes with everything! For the binding I used an old Katie Jump Rope fabric that I scored around this time last year. I may save all of the two yards of it that I bought for binding...I LOVE how it looks on the edge of a quilt! 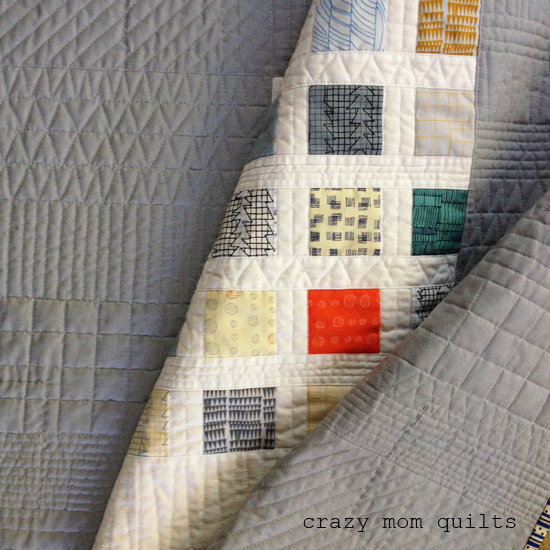 So much good texture in this quilt...and it hasn't even been washed yet! 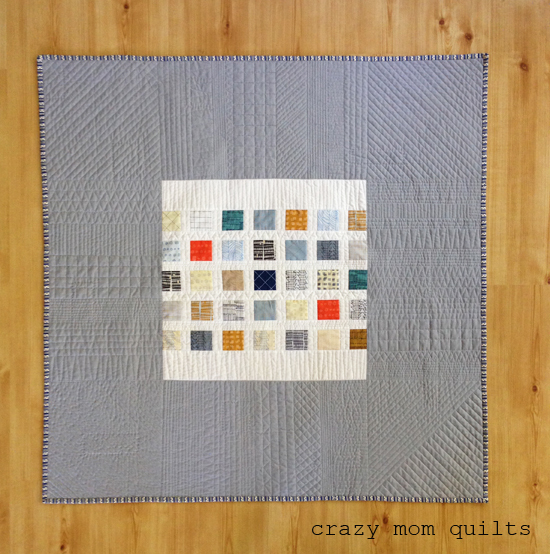 The quilt measures 42" square. I'm happy to have it done! Hurray for finishes! Now it's your turn! Please link up your finishes for the week. As always, thanks for joining me for finish it up Friday! First off, thank you ALL so much for your kind words about my oh my stars! quilt. Those long time WIPs make for especially sweet finishes! I appreciate each and every sweet comment that you left! About a week ago, I started a new portable project. 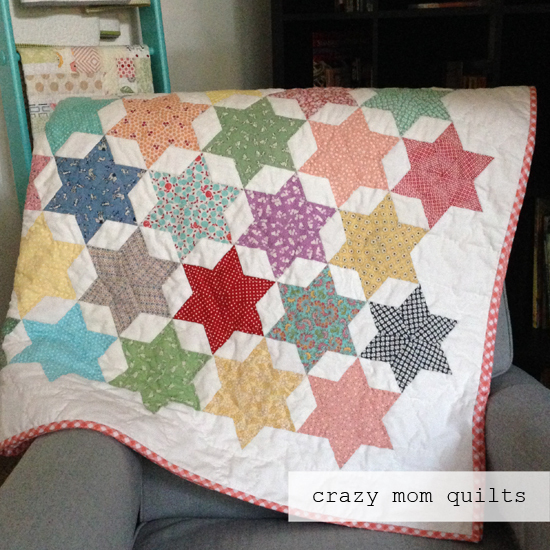 I had the need for one, since my star quilt is finished. 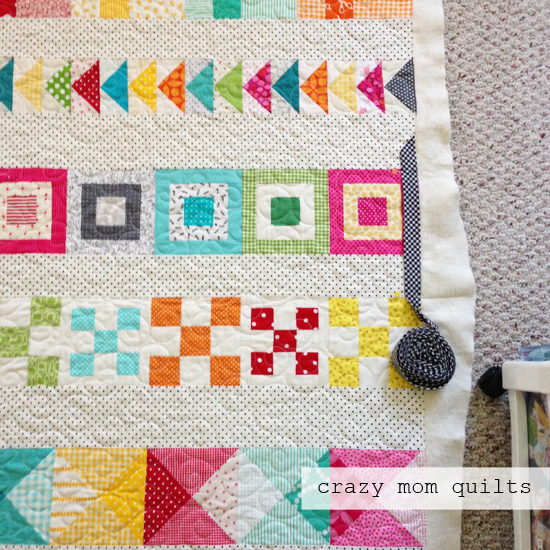 I have to say, this quilt was quite pre-meditated! I've wanted to make a quilt titled "dot your i's" for years and years--at least 8 years, if I had to guess. The problem is, I only had the title, but no design idea to back it up. No matter how hard I tried, the idea just wouldn't come. 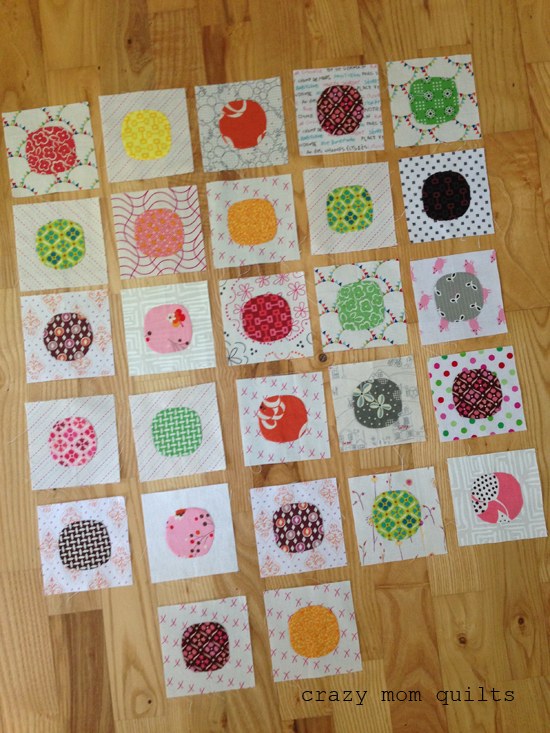 Well, after I made this pin cushion, I KNEW I wanted to make an entire quilt with "squircles" on a patchwork background. I recalled my title and paired the two together. Perfection!!! 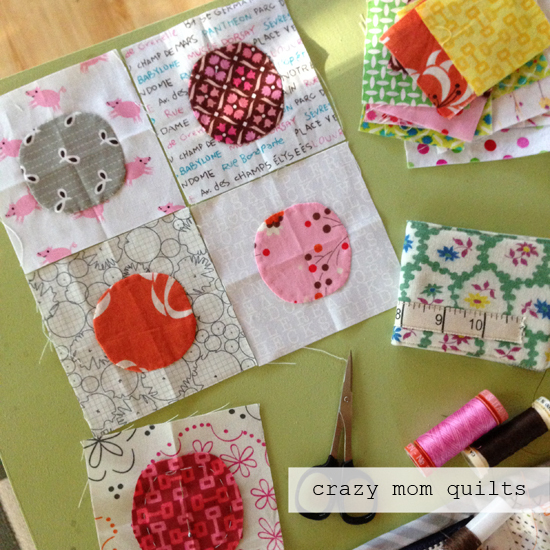 Each of the irregular circles are hand basted onto a 4" background square and then appliqued down. I was inspired by Carolyn's aerial grove quilt and followed the hand applique instructions she gives in her book Savor Each Stitch. 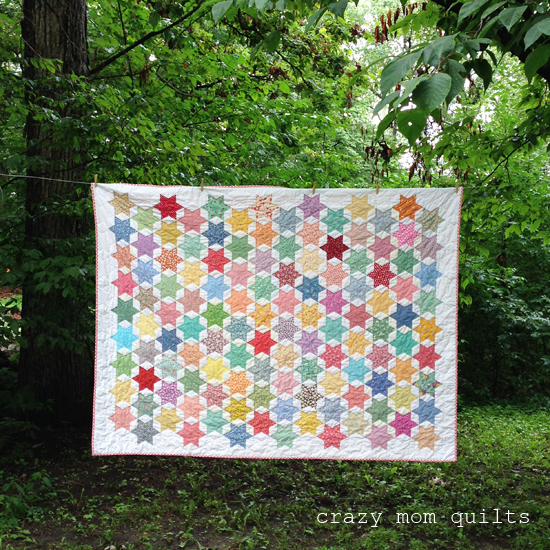 I am using a variety of light fabric for the backgrounds (much like this quilt) and my most precious, most hoarded scraps for the circles. (Original Flea Market Fancy, Katie Jump Rope and other older Denyse Schmidt prints.) I figured since I will be hand stitching, I will get maximum enjoyment from these precious fabrics. oh my stars! quilt complete!!! 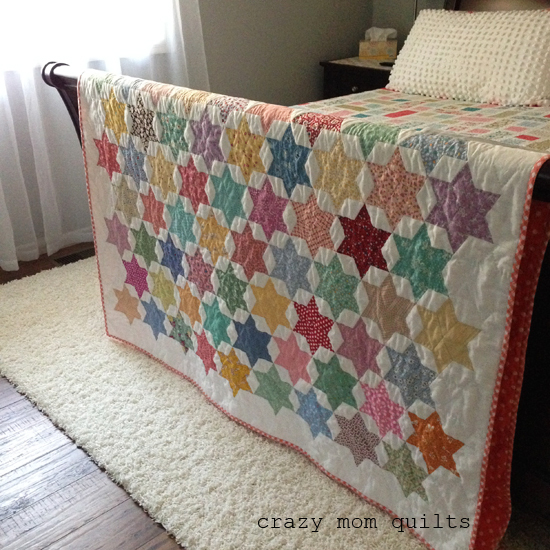 This quilt was a labor of love, to say the least! I started by cutting out my own templates (2" 60 degree diamonds) from cardboard. I English paper pieced (hand pieced) the entire top with countless tiny stitches. I drafted my own side templates to fill in the gaps and to make the edges straight. I couldn't bear cutting through any hand stitching! It was worth the extra time and effort to make that happen. After all that time invested in the top, I had to hand quilt it! 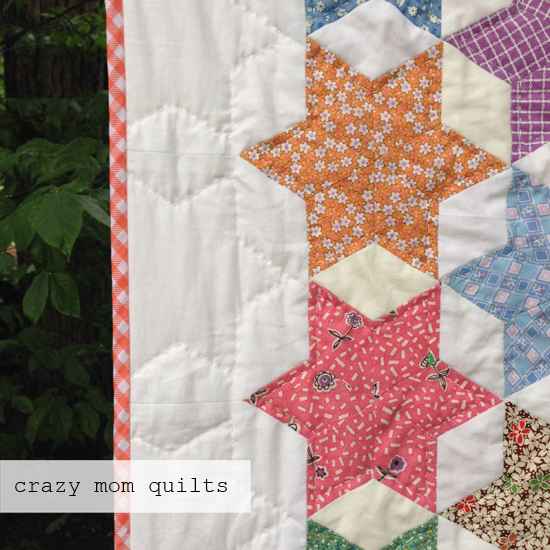 I thought it would be a good winter project, but I ended up quilting most of it this spring and early summer. Funny how that happened! 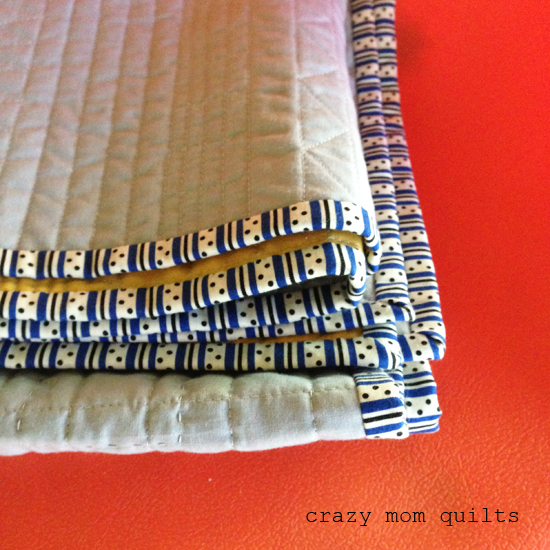 I basted it last fall, and I'm quite surprised that I sped through the hand quilting process that quickly. For the fabric, I used 30's reproduction fabrics and polka dots...and I'm so glad that I made that choice early on. It definitely was the right choice! That pink star is feed sack fabric that came from my grandma's house. 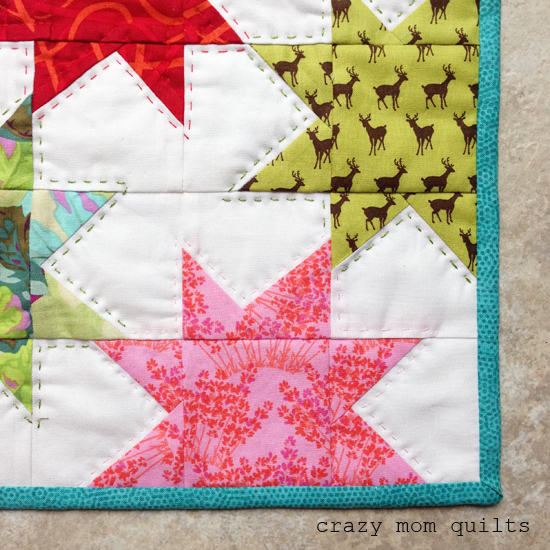 I love that there is some of that included in this quilt! 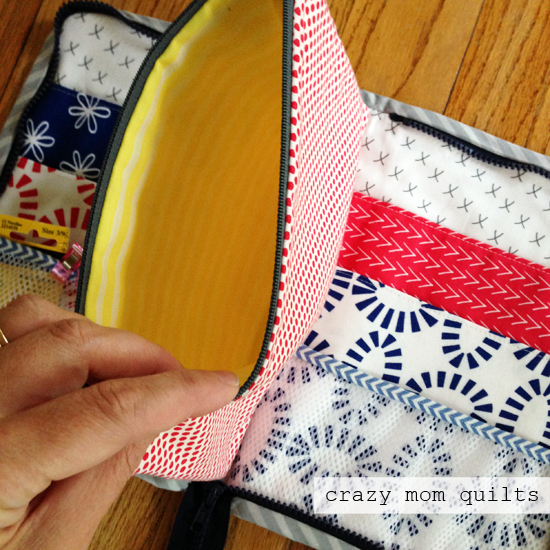 I also LOVE that gingham bias binding! 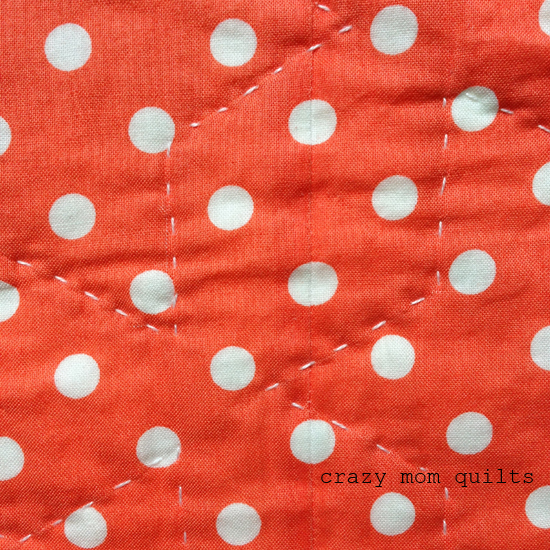 My original plan was to back this quilt with red and white polka dots (always an obvious choice for me) but I had yards and yards of this light orange coral-ish color in my stash. It worked out very well as backing and it felt good to use something I had on hand. ...and especially pretty at the end of my bed! I'm determined that after all that work, I'm going to actually USE it! The quilt measures 62" x 82". Now it's your turn! Please link up your finishes for the week. Thank you for joining me for finish it up Friday!!! 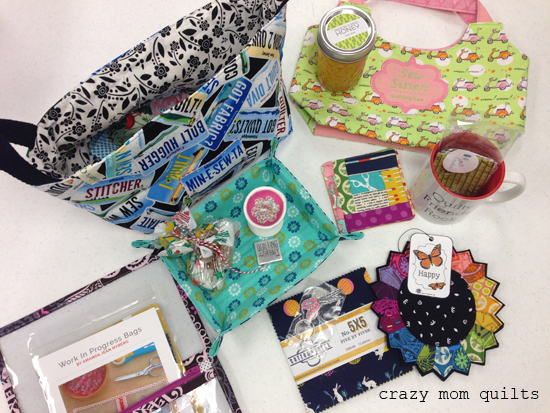 The winner of the scrap pile is Karen H. Thanks for all of you who played along! I don't know about you, but I like to keep tabs on my WIPs. The number fluctuates, obviously, and once in awhile I lose track, but usually only for a few weeks. I like to know where I stand and how frantic I should be. Ha! Last week, after my massive week of finishing, I rewarded myself by counting them up and taking an honest assessment. It had been awhile! 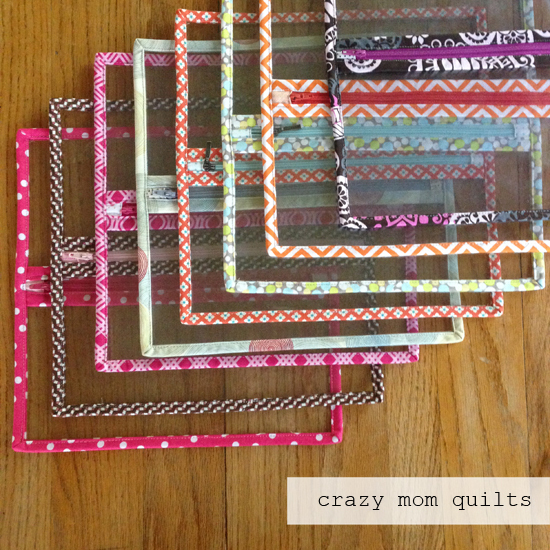 I discovered that I have 25 quilt WIPs and one table runner. It could have been so much worse! Since my count, I've finished a quilt, but I've also added a new one. (More on those later!) I'm glad that it wasn't any higher than 25, because that's my limit. 25 is one step away from panic. :) I'd really like to get that number down to 20....perhaps even before the end of summer! It's good to have goals, right? 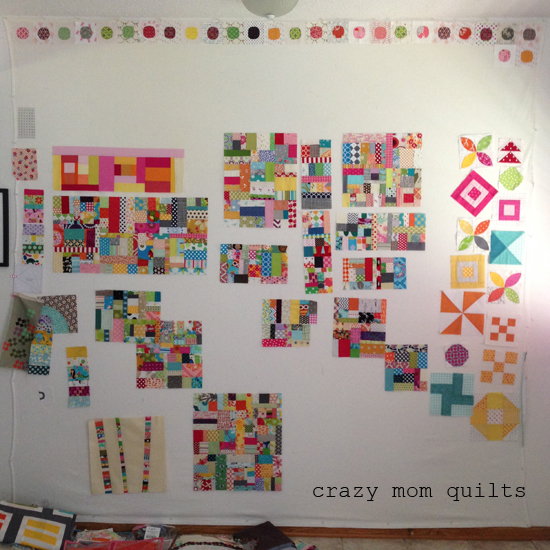 I'm a part of the Minneapolis Modern Quilt guild and we did an optional scrap swap challenge. Last night was reveal night...and it was fabulous! I'm so glad I joined in. 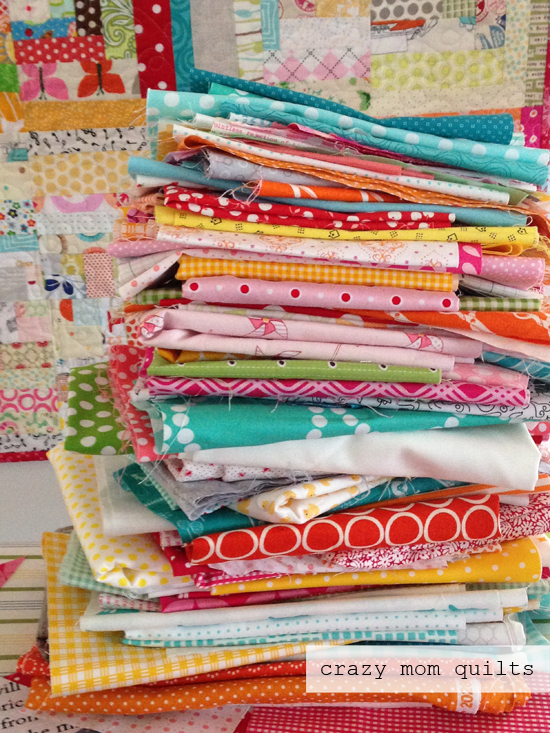 When it comes to scraps, it's hard for me to say no! I made a sparkle punch mini quilt for my partner. It measures about 18" x 20". 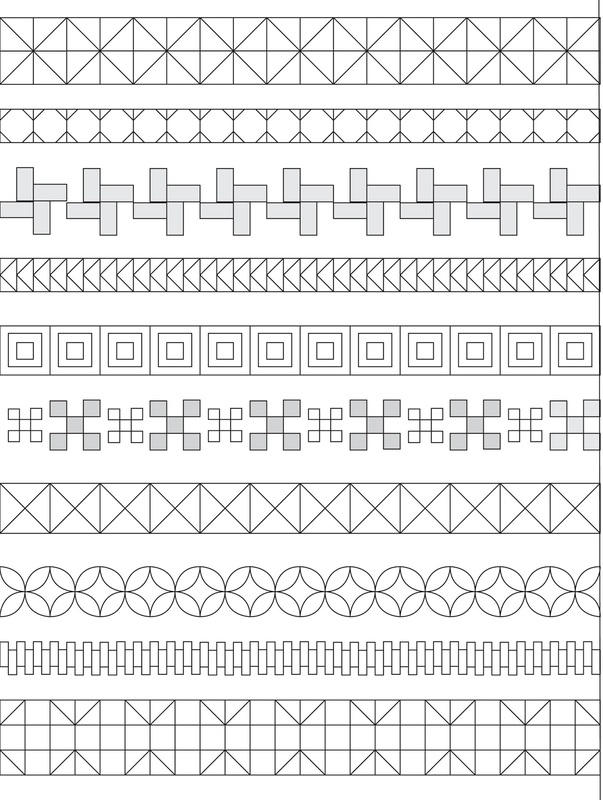 This is a pattern that has been on my "to make" list for a long time. 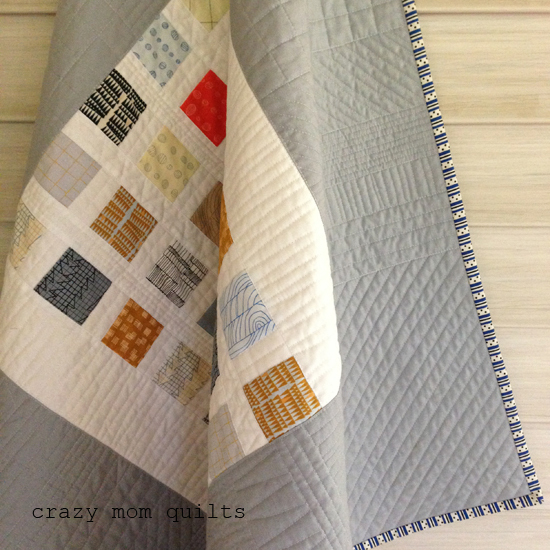 I love this quilt and I had a blast making it! It was hard to let go, but I think that's a good sign. Right? I thoroughly enjoyed the color palette of scraps I had to work with! 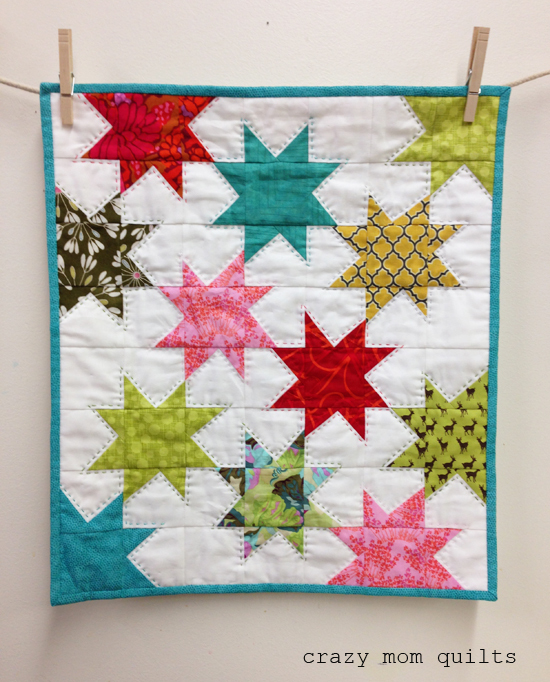 I started by quilting inside the stars, but the thread just blended in, so I switched gears and I quilted just outside the stars instead. So much better! 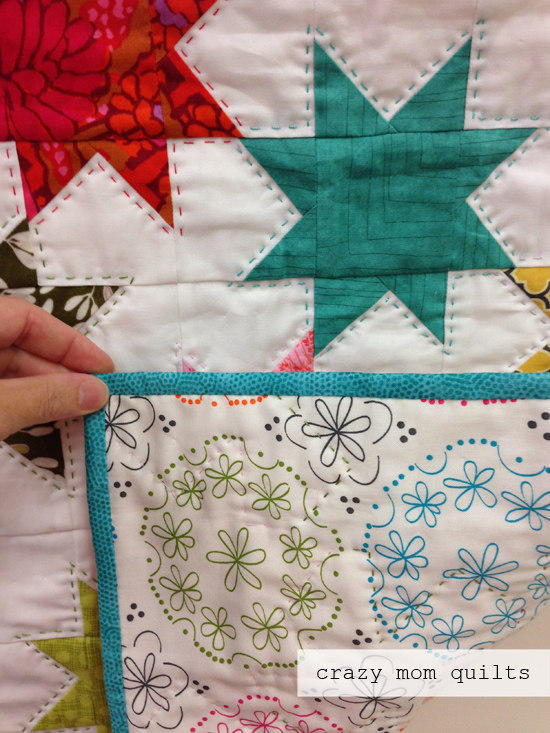 I like the accent of big stitch hand quilting, even if the stitches aren't perfect. Here's a little peek at the back. This print is from my upcoming good neighbors line and it was a perfect match to the front! This fabric will be available in regular width (44" wide) and in extra wide (108") for backing. I can't wait to back ALL kinds of quilts with it! 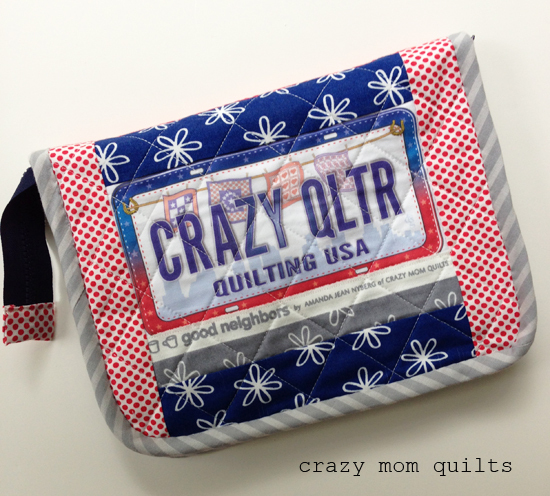 I think it will be pretty all quilted up. I didn't make this, but my friend Cindy did. I am not sure why she thought of me when she found this license plate fabric (ha!) but I'm so glad that she did. She made me this wonderful pouch using the flora supply case pattern by Clover and Violet. 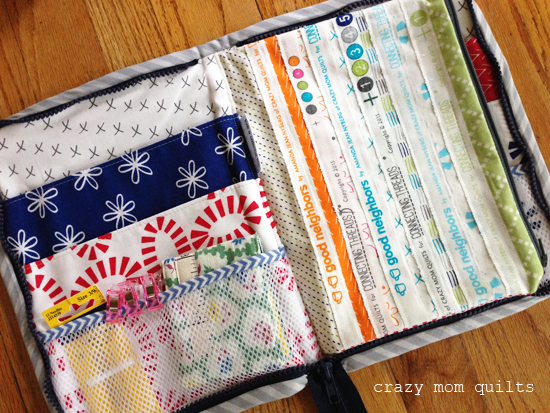 Cindy is the selvage queen and she included a bunch of them on the outside of the zip pouch section. I love that!! I've already been using it for carrying around my hand stitching supplies. It's so handy! Thanks so much, Cindy, for a wonderful, thoughtful (and practical) gift! Ok! Now it's your turn! Please link up your finishes for the week. Thanks for joining me for finish it up Friday! Hope you have a great weekend. I'm going to go take a nap! Last weekend was my Gruber's retreat weekend with some dear friends. It was filled with laughter and shopping and eating and sewing and very little sleeping....just like a retreat should be! I'm not quite sure how it all came about, but at some point during the weekend, someone threw down a micro quilt challenge. And, to quote my daughter, "I wouldn't say no!" 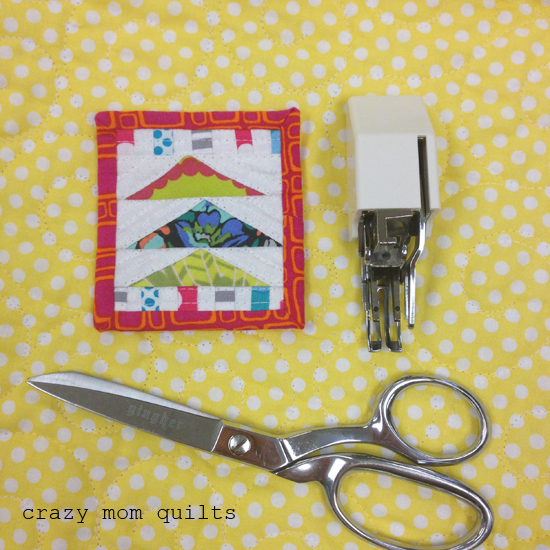 There was much discussion as to what a micro quilt is. In the end, we decided that it had to be under 4" finished on each side and fully bound. One clarification...it is even smaller than a coaster! My friend Doris took the challenge as well. Her quilt is on the left. Look at those cute little flying geese! 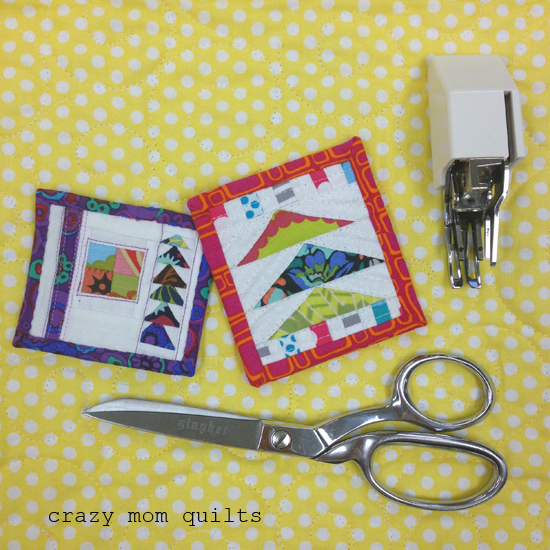 Her micro quilt is even smaller...measuring 3" x 2 7/8"...and has double fold binding! Impressive! There was no winner or loser in the challenge...we did it just for fun! I had the chance to be a personal fabric shopper for my friend, Michelle, who doesn't like fabric shopping. (I don't understand what that means, so please don't ask! Hahaha!) 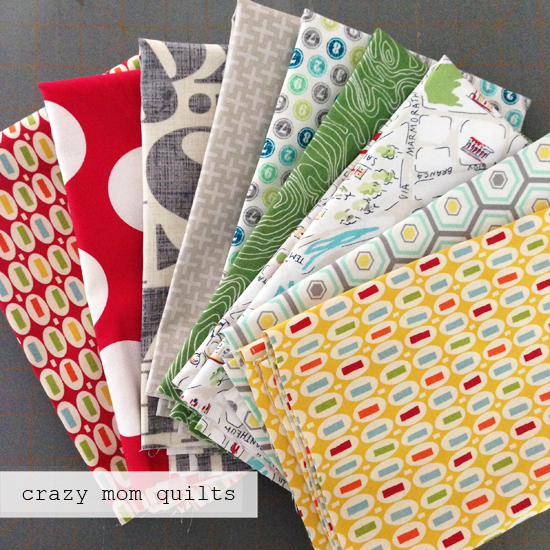 She gave me a certain dollar amount to spend on fabric that I would normally pick for myself. It was good that she emphasized that I should select things I would normally pick for myself, because I kept thinking of what her preferences might be. In the end, I liked my selections so much that I bought one stack for her AND one stack for me!! It was a fun experiment and thankfully she was happy with my selections. We are already planning on doing it again next year! I can't wait! 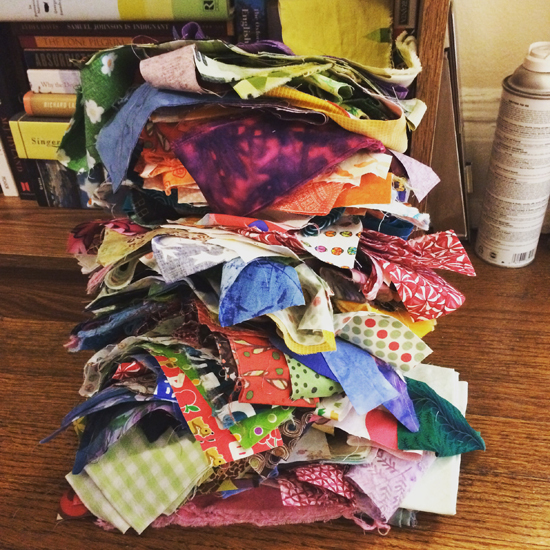 I dream of having a stack of 20 quilts just sitting around waiting for me to hand stitch the binding. (I really AM crazy, huh???) Well, I'm 3/20 of the way to my dream, apparently! 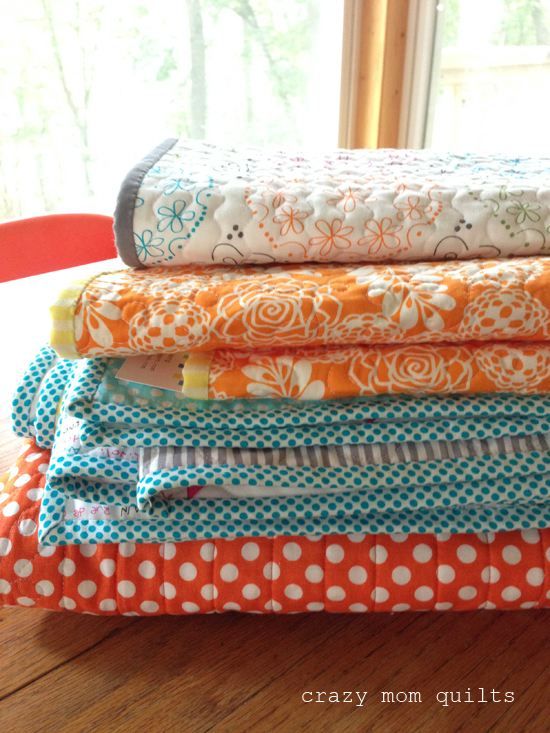 I did a whole lot of sewing, quilting, binding making and knot burying this weekend. But, I don't intend to let them sit unfinished for long-I'm soooo ready for some quilt finishes! 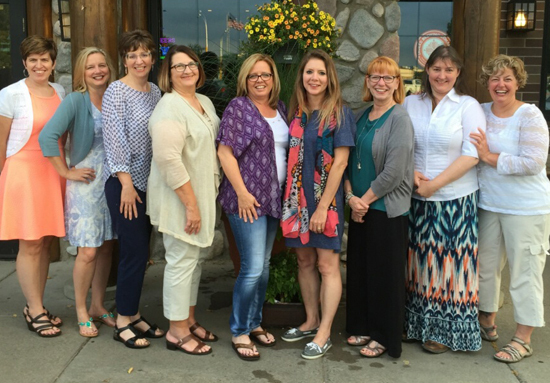 This was our group this year: (Left to right) Me, Rene, Doris, Mary, Michelle, Terri, Cindy, Shelly and Stephanie. I'm so thankful for the chance to hang out and sew with these lovely ladies and I miss them already! This was a busy week, but aren't they all? :) On Wednesday I had a marathon sew day to work on making "happies" for my friends for our Gruber's retreat weekend. "Happies" are simply little gifts for friends to brighten their day. They've become a tradition at our retreat and it is fun to think up something unique to make for them. We've been exchanging gifts for at least 5 years now, so the bar is getting quite high! These are the "happies" from this year. See what I'm saying about the bar being high? It's so fun! Getting together with friends for 3 1/2 days of sewing is such a treat and I'm so thankful for these lovely ladies! I'm so happy to have a decent finish for this week, too. Yay! 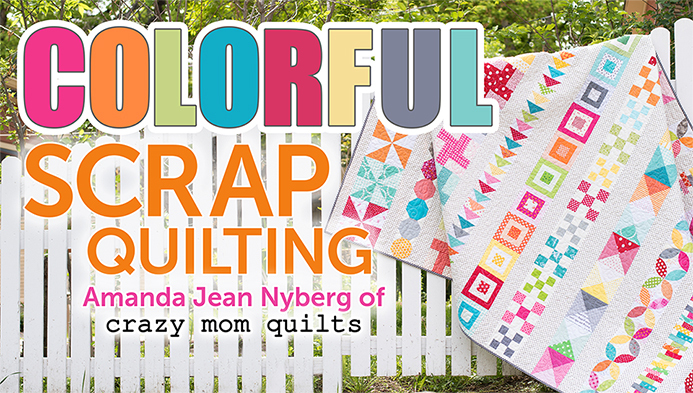 My Craftsy class, Colorful Scrap Quilting, is LIVE today! I'm extremely nervous just thinking about watching it, but my curiosity may get the better of me. My kids are planning/threatening to play it on our large TV. I think that's the worst case scenario and if they do, I may have to run away for a little while. Hahaha! 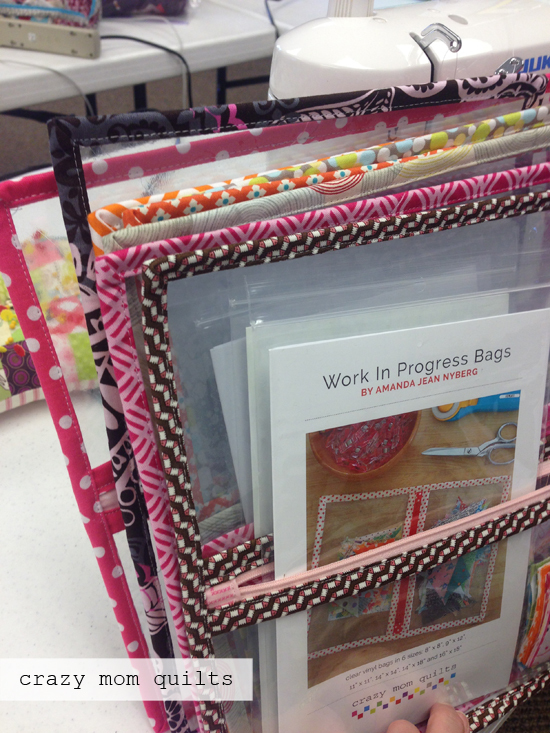 I'm so grateful for the opportunity to teach a Craftsy class, even if it did scare the living daylights out of me. :) There were two factors that kept me going amid all the self doubts: 1. 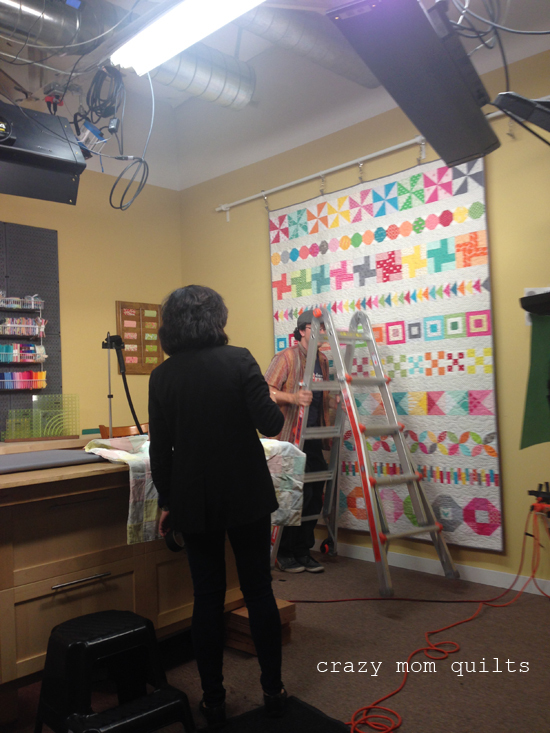 I had talked to a few close friends about taping a Craftsy class for at least a year and I didn't want to compromise my integrity. 2. Turning 40 was a good motivator, too. It was a seize the day (or year) kind of thing. It may sound silly, but it really helped me face my fears! 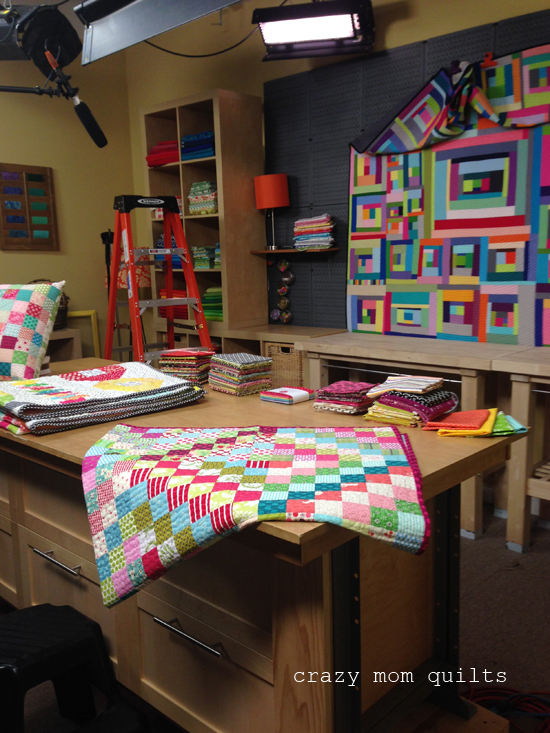 The quilt itself was designed in Illustrator, on a deadline, of course! Designing on a deadline is, um...interesting! 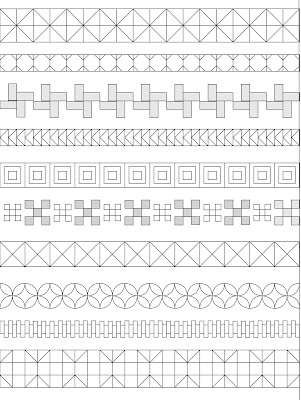 Designing a quilt in Illustrator is rarely my first choice. But, sometimes you gotta do what you gotta do! 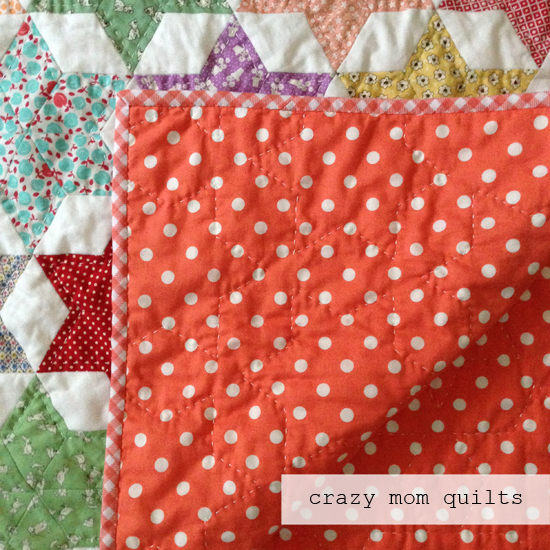 After spending a few days wondering if the quilt was actually going to work, (I was honestly wondering!) 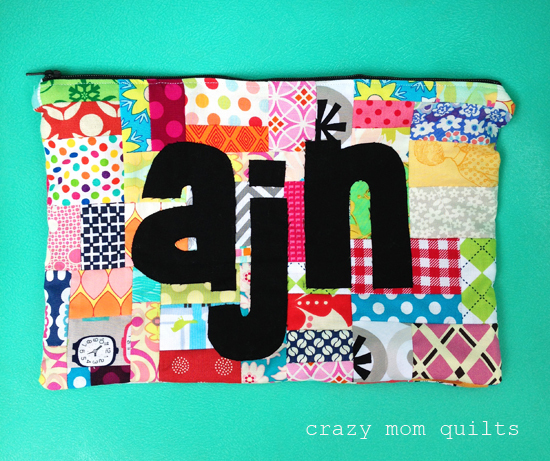 I decided that there was only one way to find out---start sewing! 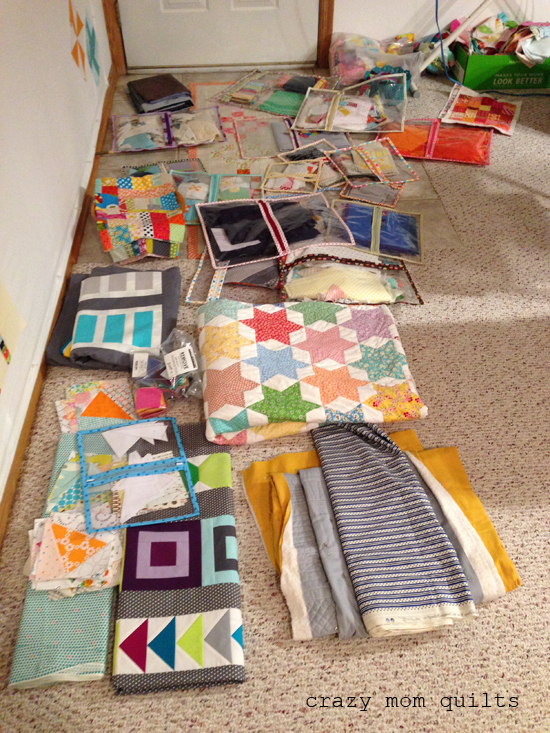 All of the class prep (and quilt making) was done in a quick timeframe. I think I had 4-5 weeks to prepare. It was intense! Thankfully, my family and a few close friends cheered me on the whole way though. That helped so much! I spent many, many hours prepping before we actually filmed. I went through a lot of scratch paper planning and doing the math. SO MUCH math! So many chicken scratches! 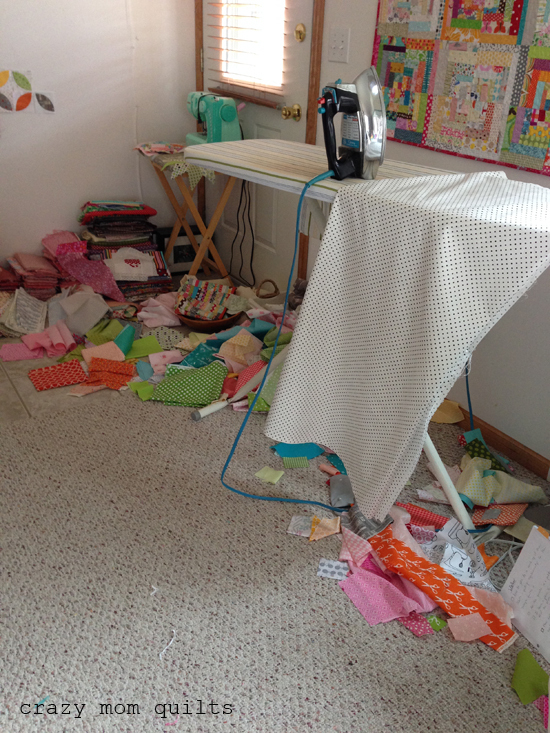 Some days I sewed for about 12 hours! I took a ton of photos as I worked, evaluating the progress every step of the way. 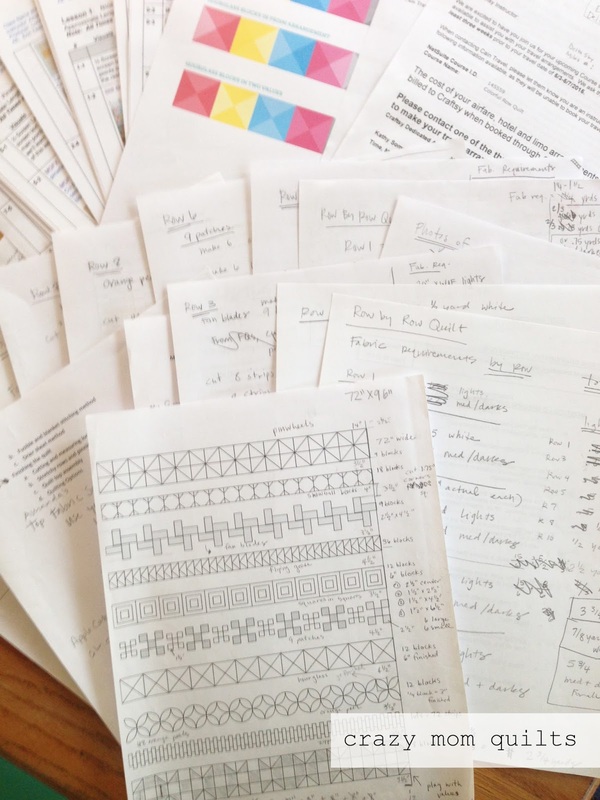 There was a lot of editing of fabrics, colors and blocks. I generated a ton of scraps, too. I put all the remains in this paper box lid to sort through for another day. That should be LOTS of fun! 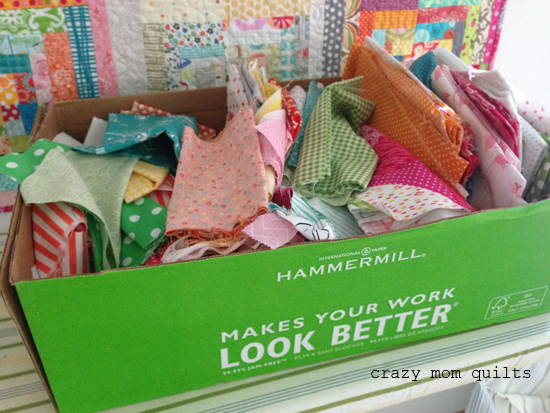 It's a darn good thing I like scraps as much as I do! My producer asked me for a photo of my studio, so I had to clean up my room during that time as well. 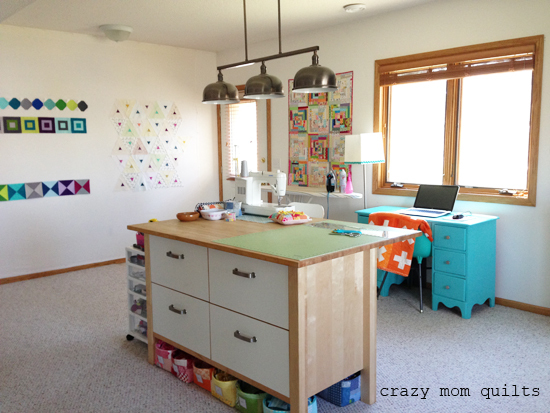 My craft room is never this clean. Only for a few minutes while the photos were being taken. It's my husband's dream to have it this clean. Even occasionally would do! This is what it looked like most of the time I was working. Or sometimes even worse! After I had the top completed, I handed the quilt into Steffani's capable hands for long arm quilting. She did an amazing job on it! It was fun to bind it because it was almost finished and I got to admire her beautiful quilting! The taping itself was nerve-wracking, but the crew I worked with was so fun. They are good at what they do! We had a great time joking around between filming segments. 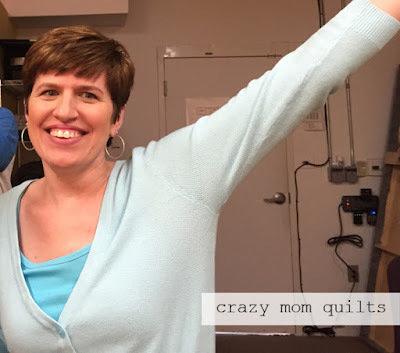 (It was fun to use quilts I've made as back drops!) We laughed a lot and worked long days. It was quite an experience! If you want to see a trailer of the class, you can view it here. My son and I watched it and he said, "Wow, they made you look good!" He sounded a little surprised! Hahaha! I realize that this is quite a long blog post, but I think it's important to share the process behind it all. SO much goes on behind the scenes and it can look easy, but it all is a ton of work. It's good work, though, and I'm thankful to have it! I'd like to say a HUGE thank you to my friend Tara, who was so helpful to me throughout the entire process. 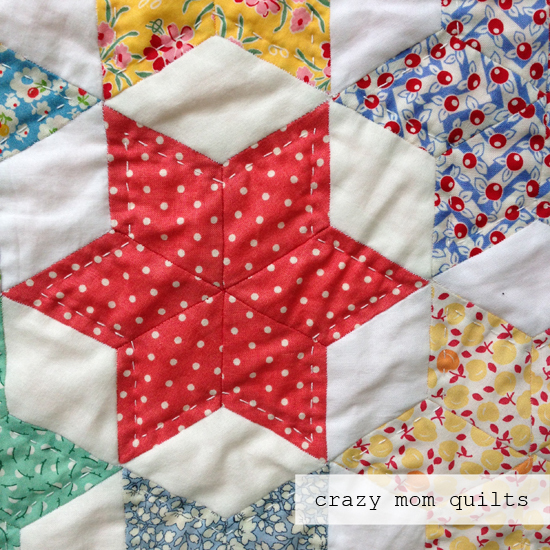 And a big thank you to all of you, my readers, who have left kind comments about the class and the quilt already. I appreciate your support more than I can say! I finished knitting another pair of socks this week--my 14th pair to date! I love gray and I wear a lot of it. It was surprisingly difficult to find a decent gray sock yarn, but I found some on a trip to Duluth earlier this year. 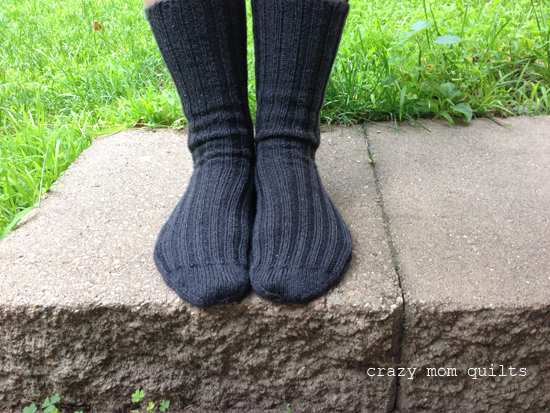 I used my basic sock pattern, which you can find here. I'm sure that these socks will be in heavy rotation this coming fall/winter. They are so comfortable! One year ago, I had a sock finish as well! Isn't that funny? Also, today, I am finishing up my 30's. That's right...I turn the big 4-0 tomorrow. I'm not sure that I'm excited about that finish, but I guess it's better than the alternative! Ha! Now it's your turn! Please link up your finishes for the week. Thanks for joining me! I hope you all of you in the US have a great and safe holiday weekend! Hello, hello! 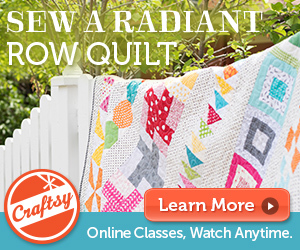 I'm super nervous and a little excited to announce that my Craftsy class is scheduled to released next week! I haven't really said much about it since I spilled the beans in May, but today I'd like to share a little bit about the projects in my class. I plan to write a post about the process another day...it was quite an experience! At the end of this post, I will offer you a chance to win my class! 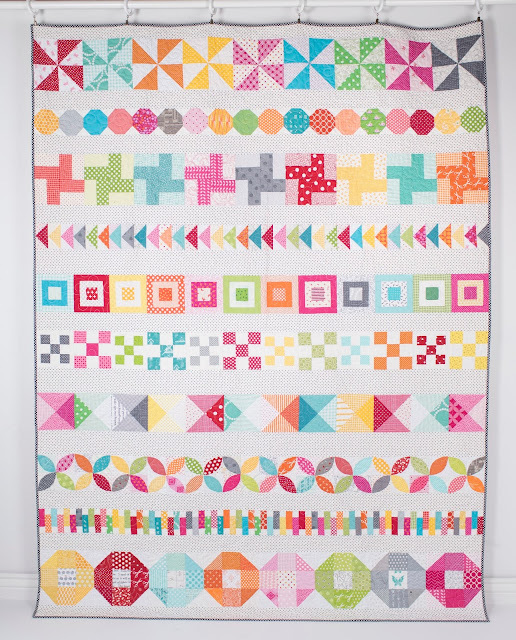 I designed this colorful row quilt specifically for my Craftsy class. 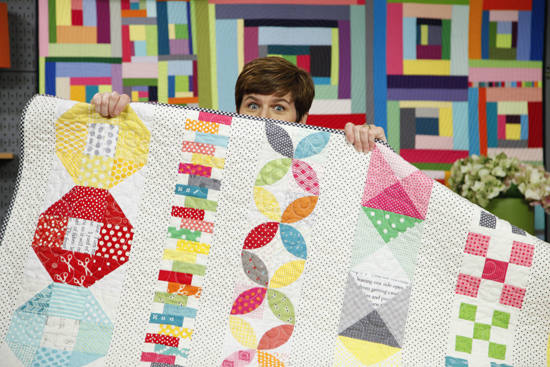 The quilt features 10 different rows of patchwork. 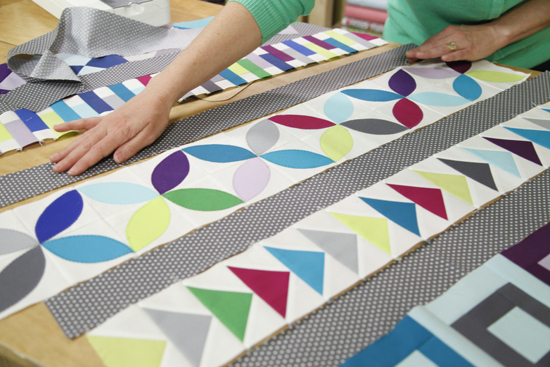 In the class, I share tips on fabric selection and walk through the construction of each block/row, step by step. Rather than using a plain white background for the quilt, I used a small black and white polka dot. It tones down all that bright happy color (in the best way, of course) and gives it a bit of a vintage feel. This version is BIG, measuring 72" x 96". I love how it turned out so very much! 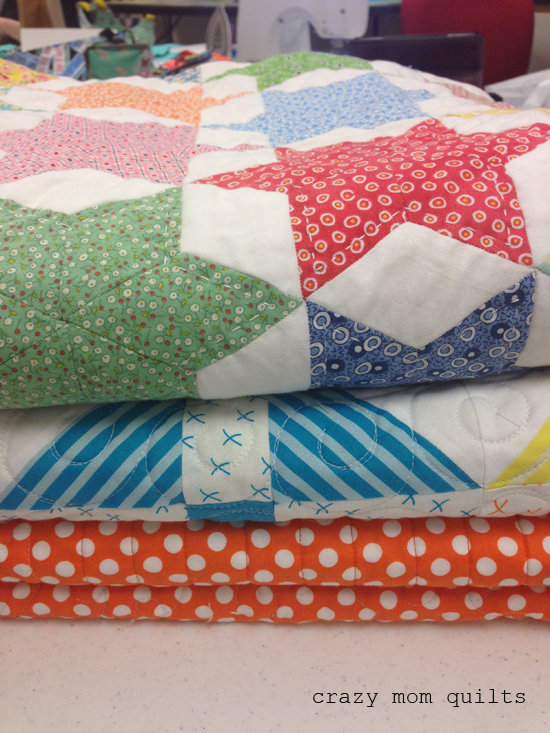 I also offer a smaller option--a baby size---which uses some of the same elements of the large row quilt. 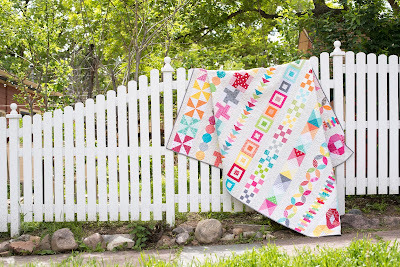 This is a good way to explore some of the techniques, but with the ability to finish the quilt more quickly. The baby version was made in a completely different color way, which changes the overall look and feel of the quilt. I love to explore and imagine all the possibilities that you can obtain by simply changing up the fabric choices. 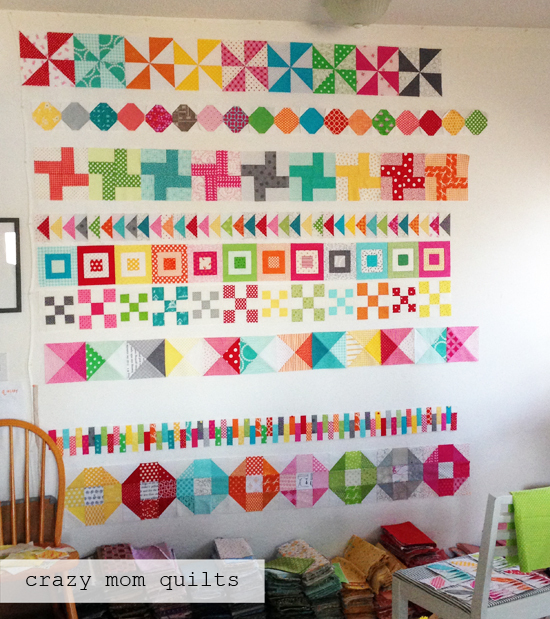 I would love to make yet another version of the large row quilt, but this time using all Denyse Schmidt fabrics. I think it would be fabulous!